By Forum News Service on Apr 2, 2019 at 2:51 p.m.
A statewide bounty program launched Monday, April 1, with the goal of protecting pheasant nests and getting South Dakotans interested in trapping in the process. As part of Gov. Kristi Noem’s Second Century initiative, South Dakota Game, Fish and Parks will offer a $10 bounty for each nest predator tail trapped from now until Aug. 31, or until the $500,000 cap is reached. The bounty can be collected by anyone who brings the entire tail and tailbone of a raccoon, striped skunk, badger, opossum or red fox to their wildlife regional office between 8 a.m. and 5 p.m., Monday through Friday. The animals must have been trapped in South Dakota within the program’s specified time frame, and roadkill animals will not be accepted. An environmental review is under way on plans to increase coyote trapping in the city of Torrance, according to an announcement issued Wednesday, Feb. 20. The revisions to the city’s coyote management plan were approved in November amid what have been ongoing resident complaints about the loss of pets to the wild predators. The move also came after it was revealed that the city had trapped just one coyote in the two years leading up to the fall of 2018. The city’s reporting data tracking sightings and coyote attacks on cats and dogs also had fallen behind. The revisions to the plan would institute a five-month active trapping season from October to March each year. Trapping also would be expanded to geographical areas where dangerous coyote behavior is reported. Currently, the strategy is more pinpointed to individual locations that have been reported. The new measures also call for hiring a part-time, civilian coyote management staff assistant and stepping up the city’s education and outreach programs. The goal is to have the revised plan in place by fall. Cities throughout the nation are increasingly dealing with coyote management strategies as the animals have made new dwelling places in urban areas where food is plentiful. Many cities rely heavily or even solely on wildlife education programs for residents and include no lethal management methods. More recently, as the problems have persisted, some cities have begun instituting targeted trapping and euthanasia in neighborhoods where aggressive coyote behavior is reported. The issue is an emotionally heated one with animal rights groups pushing against lethal methods and residents who believe cities must do more to protect people and pets as a matter of public safety. SPOKANE, Wash. — The state of Washington will take steps to kill members of a wolf pack that have been preying on cattle in the northeast corner of the state. The Department of Fish and Wildlife says members of the Togo pack have preyed on cattle three times in the past 30 days, and six times in the past 10 months. In the past four decades, coyotes have moved into New Hampshire from the west, becoming a routine part of the landscape, and now some advocates think we shouldn’t be hunting them quite as much. Linda Dionne, who openly speaks against hunting and trapping as part of a Manchester group called Voices for Wildlife, has petitioned the New Hampshire Fish and Game commissioners to change the rules, closing the coyote season from March 31 to Sept. 1, when pups are being raised. The group argues that allowing hunting while young coyotes are being raised is cruel and increases the chances that a litter could be left to starve. They also say the coyote’s relentless expansion throughout North America has shown that hunting doesn’t work to control a species that is traditionally seen as a nuisance. Their request was denied in a letter from Fish and Game Executive Director Glenn Normandeau. Coyotes can be hunted during the daytime all year round in New Hampshire, as is the case in most neighboring states, and hunted at night from January through March. Trapping season is limited to winter. The Voices of Wildlife group said it would continue to raise the issue. “The firearm’s season is for recreational hunting. Having a closed recreational hunting season would not impact the resolution of possible conflicts associated with coyotes. Nothing would change regarding property owners being allowed to use lethal measures to handle an individual conflict,” the group wrote in response to Normandeau. Coyotes are, in some ways, a great success story for wildlife rehabilitation, returning an alpha predator to many ecosystems. Yet it is a success that has occurred entirely in the face of human opposition. Coyotes are members of the canine family, along with dogs, foxes and wolves, and are not native to New England. They originated in the Rocky Mountain region of the U.S., but have been expanding throughout North America for at least a century, filling an ecological niche left by the elimination of wolves, cougars and other large predators. The first verified account of a coyote in New Hampshire was in Grafton County in 1944, according to state records, but they only began to spread throughout the state in the 1970s and are now widespread. About 5,000 are thought to live in New Hampshire. The coyote population can expand relatively quickly because females are willing to travel long distances from where they were born before making dens and having pups, unlike the females of many other carnivore species. This allows a breeding population to get established quickly in new territory. More importantly, they are generalists that will eat almost anything and can adapt to life in many circumstances, from the deep woods to suburbia to the most urban of areas. Coyotes are now found all along the East Coast from Maine to Florida, even on islands like Nantucket and deep in cities like Boston and New York. Although details are still being studied, it appears that during their eastward expansion the western coyote interbred with some domesticated dogs and with red wolves, which are larger than coyotes but smaller than gray wolves. As a result, the eastern coyote is larger and distinct from the western coyote, to the point that they are sometimes considered a distinct breed. Most states allow coyotes to be hunted all year round. Massachusetts allows coyote hunting from October to March, while Vermont and Maine allow it all year round. All states have limits on night hunting and on trapping, if the latter is allowed at all. Out West, where the coyote’s reputation as a livestock killer persists, many states even allow coyote-hunting contests, which award prizes for the most kills in a short period. Some biologists argue that, counterintuitively, extensive hunting is one reason that coyotes have spread so quickly throughout North America. Chris Schadler, a conservation biologist, wildlife advocate and author of a book about coyotes called Becoming Wolf: The Eastern Coyote in New England, argued before the Fish and Game commission that year-round hunting actually increases the number of coyotes. As she explained it, coyotes are pack animals, living in small groups that are dominated by a matriarch, usually the oldest female, who is the only female that has pups. These packs can undergo a process known as “responsive reproduction,” in which the number of young produced increases when the pack is pressured. This is particularly true if the matriarch is killed, which indirectly gives all the other females in the pack permission to have their own litters – meaning that a successful hunt might result in a larger pack next year. The issue of coyote hunting came up at the last legislative session, when a bill was debated that would have extended the nighttime hunting of the animals, beyond the current January-through-March limit. The measure died in committee. also, These two articles came out today. Few Americans probably know that their tax dollars paid to kill 76,859 coyotes in 2016. The responsible agency was Wildlife Services (WS), part of the U.S. Department of Agriculture. Its mission is to “resolve wildlife conflicts to allow people and wildlife to coexist.” This broad mandate includes everything from reducing bird strikes at airports to curbing the spread of rabies. 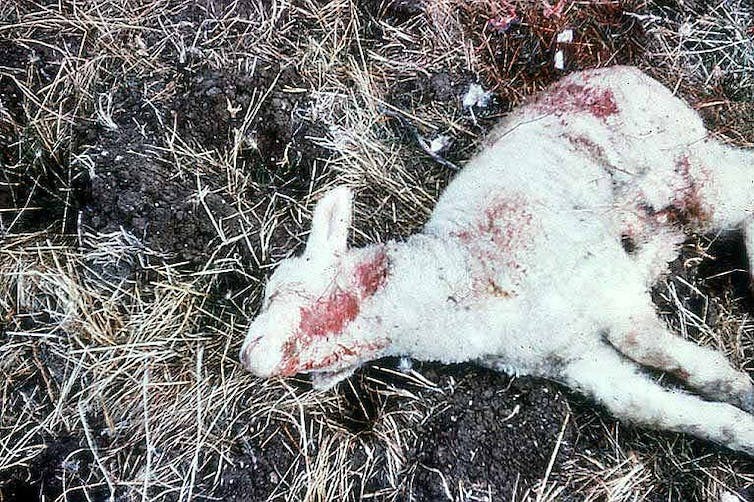 Controlling predators that attack livestock is one of the agency’s more controversial tasks. WS uses nonlethal techniques, such as livestock guard dogs and fladry – hanging strips of cloth from fences, where they flutter and deter predators. But every year it also kills tens of thousands of predators, including bears, bobcats, coyotes, foxes, hawks, cougars and wolves. According to the American Sheep Industry Association, about UD$20.5 million of ranchers’ losses in 2014 (roughly one-fifth of their total losses) were attributed to coyotes. Importantly, however, these numbers were based on self-reported data and were not verified by wildlife professionals. External review would be useful because even experienced ranchers may have trouble determining in some cases whether a sheep was killed by a coyote or a dog (dogs are second only to coyotes in reported predation on livestock), or died from other causes and later was scavenged by coyotes. To keep coyotes in check, WS employees set neck snares and other traps, shoot coyotes on the ground and from planes and helicopters, arm sheep with collars containing liquid poison and distribute M-44 “bombs” that inject sodium cyanide into the mouths of animals that chew on them. Other research indicates that even if predation is one factor in ranchers’ economic losses, lethal control is not the best way to reduce it. Even research by USDA supports this pattern. In a recent study, researchers from several universities, USDA’s National Wildlife Research Center and the nonprofit advocacy group Defenders of Wildlife analyzed wolf predation rates for sheep producers on public grazing lands in Idaho. Predation was 3.5 times higher in zones where lethal control was used than in adjacent areas where nonlethal methods were used. Human-wildlife conflict is a complex issue. Often, as some colleagues and I showed in our recent book, “Human-Wildlife Conflict,” the real problem is confrontations between humans about how to deal with wildlife. This photo shows the M-44 that killed the Mansfield family’s 3-year-old dog in Pocatello, Idaho. 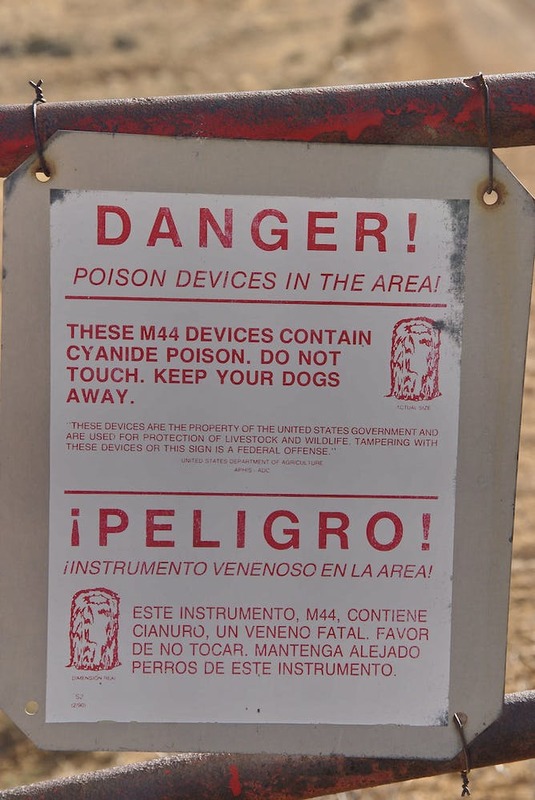 The federal government has agreed to halt the use of M-44 cyanide “bombs” to control predatory animals in Idaho after a 14-year-boy was injured and his dog killed by the controversial device. 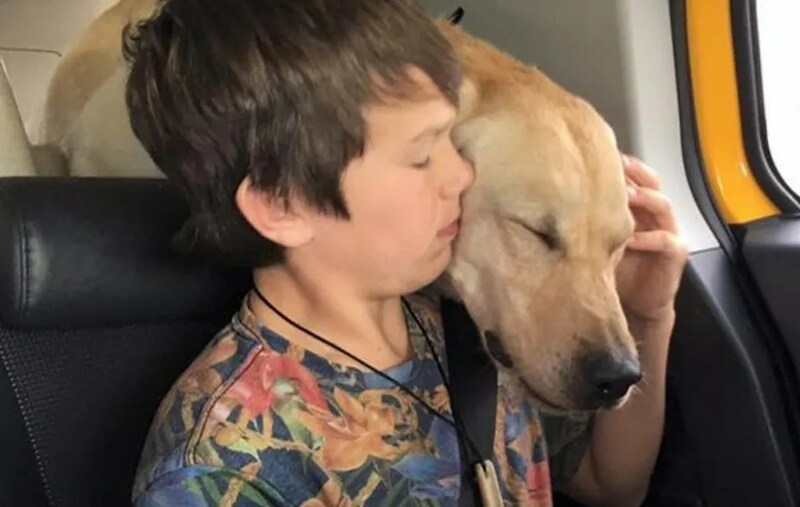 Canyon Mansfield, 14, was knocked to the ground last month when an M-44 predator control device spewed cyanide gas into his face and killed his dog. The family had no knowledge the device — set by the U.S. government some 350 yards from the Mansfields’ doorstep — was there. Canyon Mansfield, left, with his dog, Casey. Four conservation and animal-welfare groups also filed suit last week against the government over the M-44s after a gray wolf — a protected species — was accidentally killed by the device in Oregon. In a letter Tuesday to conservation groups, the USDA’s Wildlife Services program – which kills thousands of predators across the country annually – said it was halting the use of M-44s on all private, state, and federal lands in Idaho. “We take seriously the incident in Idaho,” the letter read. It remains unknown whether Wildlife Services will decide to permanently halt the use of M44s. At least 19 conservation groups have filed a petition calling for the devices to be banned permanently. The M-44s, also known as “coyote-getters,” are designed to lure animals with a smelly bait. When an animal tugs on the device, a spring-loaded metal cylinder fires sodium cyanide powder into its mouth. The devices are placed on land by Wildlife Services — a little-known branch of the USDA tasked with destroying animals seen as threats to people, agriculture and the environment. Over the years, thousands of non-target animals — wild and domestic — have been mistakenly killed by the lethal devices. Canyon Mansfield stumbled upon the unmarked device March 16 while running up a hill behind his parents’ Pocatello, Idaho home with his 3-year-old golden Labrador, Casey. When the M-44 detonated, the boy watched as his dog lay dying, suffocating from the orange-colored cyanide sprayed by the device. Since the incident, Canyon has experienced headaches, nausea and numbness and has visited a neurologist for testing, his mother, Theresa Mansfield, told Fox News. The Mansfield dog’s death follows a string of other recent incidents in which family pets and endangered species were accidentally killed by M-44s. The government, meanwhile, has called the accidental death of family pets from M-44s a “rare occurrence,” and said Wildlife Services posts signs and issues other warnings to alert pet owners when traps are placed near their homes. On Tuesday, various conservation groups praised the decision to temorarily ban use of the devices in Idaho. “This could well be the tipping point that leads to a nationwide ban of these extraordinarily dangerous devices via the legislation introduced in Congress last month,” said Brooks Fahy, executive director of the national wildlife advocacy group, Predator Defense. The groups petitioning for the M-44 ban included Western Watersheds Project, Predator Defense, WildEarth Guardians, the Center for Biological Diversity, Friends of the Clearwater, Western Wildlife Conservancy and Nevada Wildlife Alliance. Washington Department of Fish and Wildlife managers are offering an idea they believe would help them manage wolves more effectively. If one follows the wolf issue long enough, occasionally a nugget of common sense appears. Such is the case with a recent suggestion the folks at the Washington State Department of Fish and wildlife offered. Speaking during a conference call with the state Wolf Advisory Group, WDFW wolf policy coordinator Donny Martorello offered this idea: that dead livestock be considered “qualifying” victims of wolves if the time, circumstance and location of their deaths parallel other confirmed depredations. In other words, if a carcass is found near those of other wolf victims but scavengers have destroyed the evidence directly linking the attack to wolves, state wildlife managers could label it a “qualifying” attack. Previously, such cases were considered “probable” attacks and were not counted against a wolfpack. Under the Washington wolf plan, managers can kill only wolves that are responsible for four confirmed depredations within a year. While this may seem to be a bureaucratic splitting of hairs, it’s critically important for managing wolves. Under the new idea, if wolves are found to be responsible for four depredations, including any that are “qualifying,” managers could take steps to get rid of the wolves. A study found wolfpacks that are thinned soon after attacking cattle or sheep get the message that attacking livestock is unacceptable. By including qualifying attacks, managers could act quicker to thin the ranks of wolves instead of waiting weeks or months for another confirmed depredation. If managers thin a wolfpack after a long period of time, the wolves have no idea whether it is linked to a depredation, according to the study. 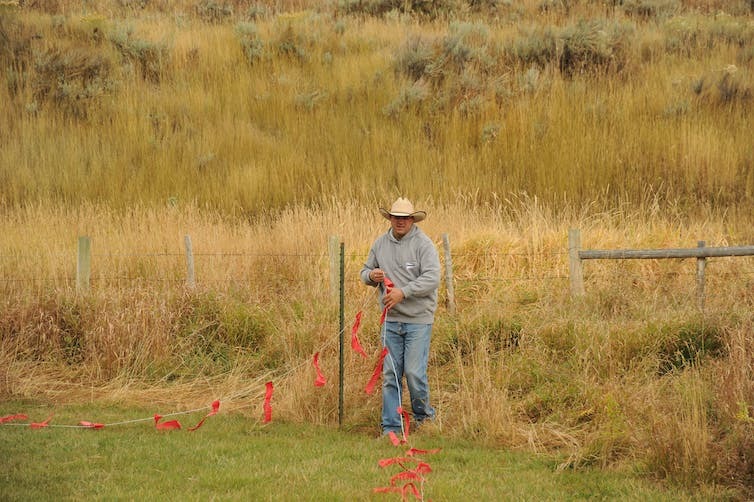 The idea is to manage wolves in a way that is both effective and assures ranchers and others that each step is effective. That in itself is good reason for the department to adopt such a common sense rule. It’s also something wolf managers in other states would do well to consider. The state Wolf Advisory Group will discuss the idea during a March 29-30 meeting in Olympia. We urge the group to take a close look at it, as common sense can be a rare commodity when dealing with wolves. The exposure of toxic, cyanide poisoning to Canyon Mansfield, a 14-year-old Pocatello boy who triggered an M-44 predator control device, and subsequent petitions calling for a permanent ban has recaptured the attention of U.S. lawmakers. U.S. Rep. Peter DeFazio, D-Oregon, has been trying to ban the indiscriminate use of lethal devices like Compound 1080 and sodium cyanide containing M-44 devices for decades. He recently introduced H.R. 1817, the Chemical Poisons Reduction Act of 2017, which seeks to permanently ban the two deadly poisons for predator control throughout the United States. These two poisons are currently used by the U.S. Department of Agriculture’s Wildlife Services predator control program, which according to its own report, killed more than 1.6 million native U.S. animals in 2016. The device that detonated in Mansfield’s face, sent him to the hospital and, ultimately, killed his dog on March 16 was an M-44. Often known as a “cyanide bomb,” it’s a device used by the USDA to prevent predators such as coyotes from harming livestock on farm and ranch lands. When triggered, the M-44 spews a potentially lethal dose of sodium cyanide powder into whoever or whatever tugs on it. Compound 1080 is a tasteless, odorless and colorless poison with no antidote. 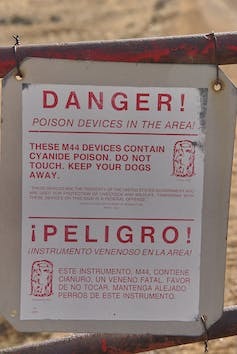 Although the EPA banned Compound 1080 in 1972, after intense lobbying from the livestock industry, it was re-approved for use in the “Livestock Protection Collar” (collars containing the poison that are placed around the necks of sheep and burst when punctured by a predator, barbed wire, or other sharp object) in 1985. Each of these collars contains enough poison to kill six adult humans. The national wildlife advocacy group Predator Defense, as well as the Humane Society, supports the new bill. The USDA’s Wildlife Services Agency regularly uses both sodium cyanide and Compound 1080 their predator control programs, which are subsidized by taxpayers. States contract with federal predator control programs to keep so-called “predator” populations down to help ranchers protect their livestock. The use of these poisons has led to the deaths of endangered animals and domesticated dogs and has injured multiple people in the past. Since triggering the M-44 device, Mansfield has experienced headaches, nausea and numbness, the family said Tuesday. Several formal petitions also surfaced Tuesday, calling for the immediate termination and removal of all devices installed in Idaho by the U.S. Department of Agriculture’s Wildlife Services agency. Mark Mansfield, the boy’s father and a local physician, filed one of the petitions directly to the White House. Backed by a coalition of conservation and wildlife organizations, the Western Watersheds Project also spearheaded a direct formal petition addressed to Jason Suckow, western region director for USDA-Wildlife Services. An additional petition filed on the website Care2 reached more than 48,000 signatures Friday evening. Mark said that although he is new to the political process of implementing new legislation, he is hopeful for change and urges people who come across the petitions to not only sign it, but also share the information on social media as much as possible. WASHINGTON—Today Congressman Peter DeFazio introduced H.R. 1817, the Chemical Poisons Reduction Act of 2017, legislation that would ban the use of the lethal poisons Compound 1080 and sodium cyanide for predator control efforts. The bill is supported by the national wildlife advocacy group Predator Defense, as well as the Humane Society. Compound 1080 is a tasteless, odorless, and colorless poison with no antidote. Although the EPA banned Compound 1080 in 1972, after intense lobbying from the livestock industry, it was re-approved for use in the “Livestock Protection Collar” (collars containing the poison that are placed around the necks of sheep and burst when punctured by a predator, barbed wire, or other sharp object) in 1985. Each of these collars contains enough poison to kill 6 adult humans. Sodium cyanide is contained within M-44 devices, which are spring-activated ejectors that deliver a deadly dose of poison when pulled on. The top of the ejector is wrapped with an absorbent material that has been coated with a substance that attracts canines. When the device is activated, a spring ejects the poison. The force of the ejector can spray the cyanide granules up to five feet. The U.S. Department of Agriculture (USDA)’s Wildlife Services Agency regularly uses both of these poisons in their predator control programs, which are subsidized by the taxpayer. States contract with federal predator control programs to keep so-called ‘predator’ populations down to help ranchers protect their livestock. The use of these poisons has led to the deaths of endangered animals and domesticated dogs, and has injured multiple people in the past. 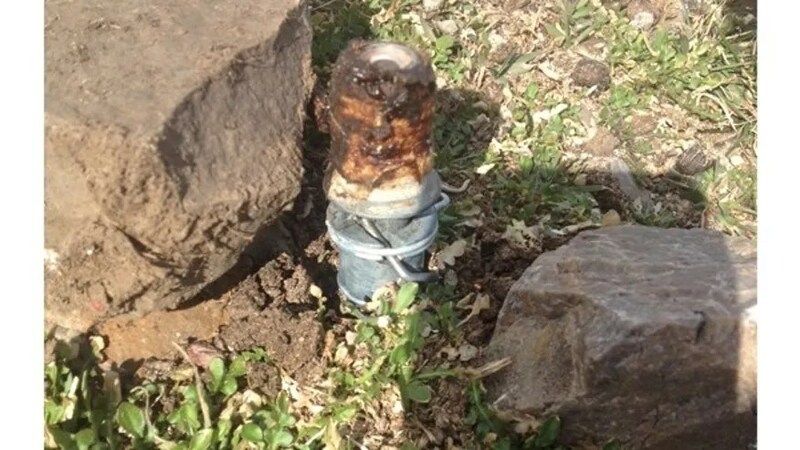 Most recently, three domestic dogs were killed in Idaho and Wyoming and a teenage boy was nearly poisoned after he accidentally detonated an M-44 device.